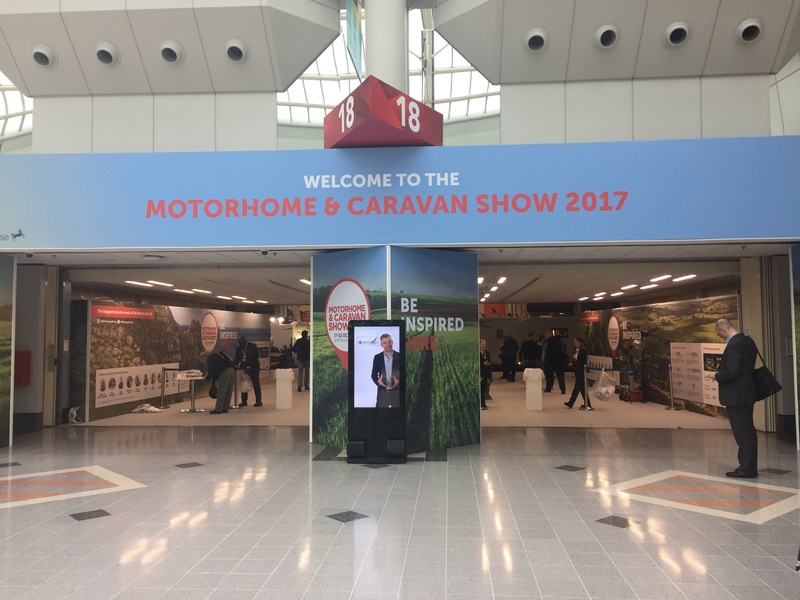 We took our one year old down to the Motorhome and Caravan Show 2017 at the NEC, Birmingham last week. We were en route to Cornwall to spend some time exploring that neck of the woods. Our motorhome suits us fine but in 5 months we will have another addition to the family and we are on the look out for a better layout for a young family. Why are there no motorhomes with sensible low down beds? Ideally we need something with a nice comfortable seating area for us parents and a separate, low down bed or two beds for the kids. It’s like searching for a needle in a haystack! Clambering in and out of motorhomes 5 months pregnant is exhausting. I did find some fun exhibitions to keep me and our daughter amused while my husband continued the search. 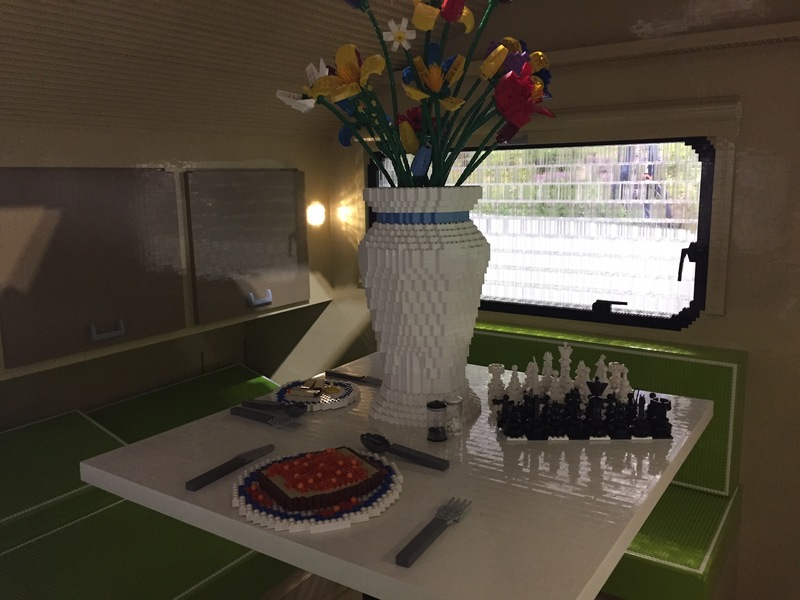 Check out this caravan made entirely of lego! 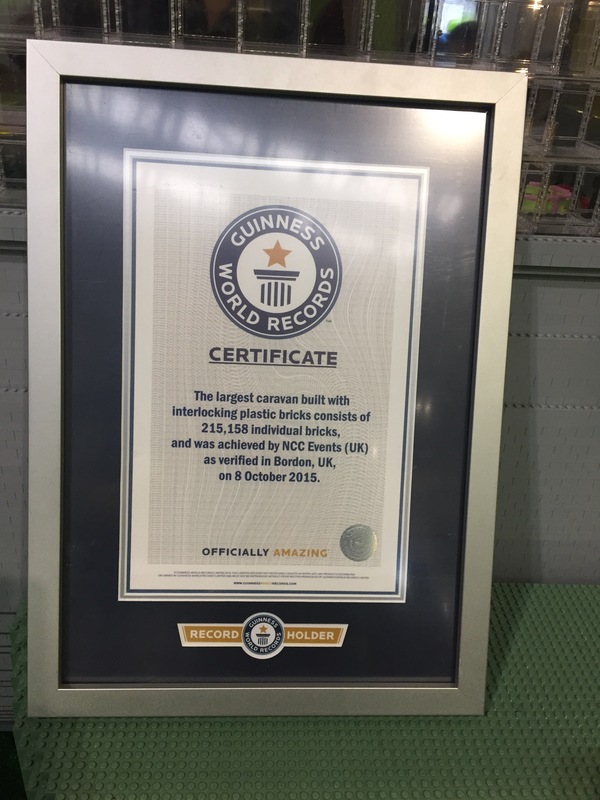 It has won a Guinness World Record for the largest caravan to be built with interlocking plastic bricks! 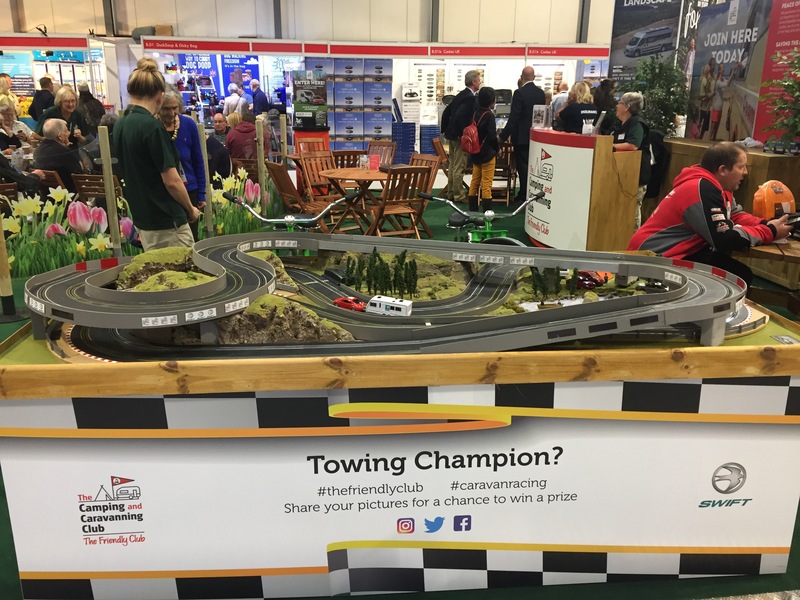 The Caravan and Camping Club stand had a great game to draw people in. This scalectric with cars towing caravans was powered by pedal power! 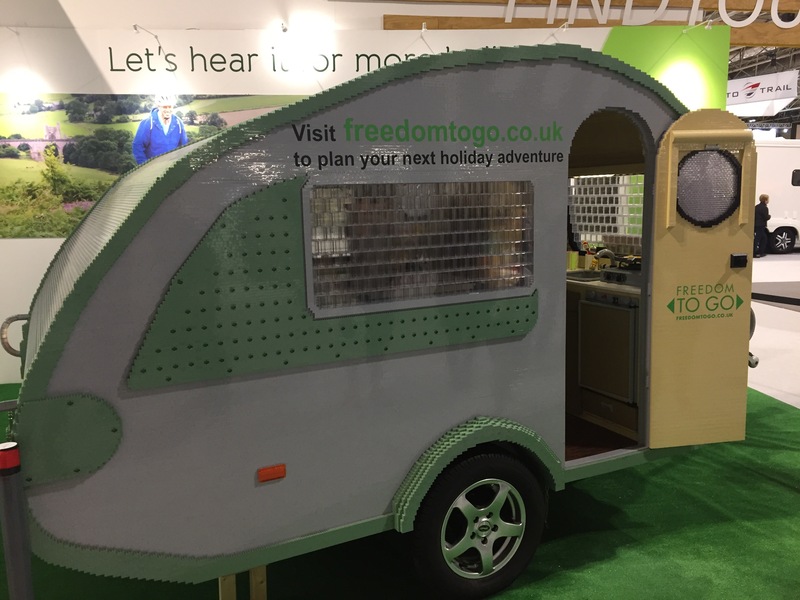 So we’re still looking for the perfect motorhome layout but we had fun and it broke up the journey down to Cornwall. 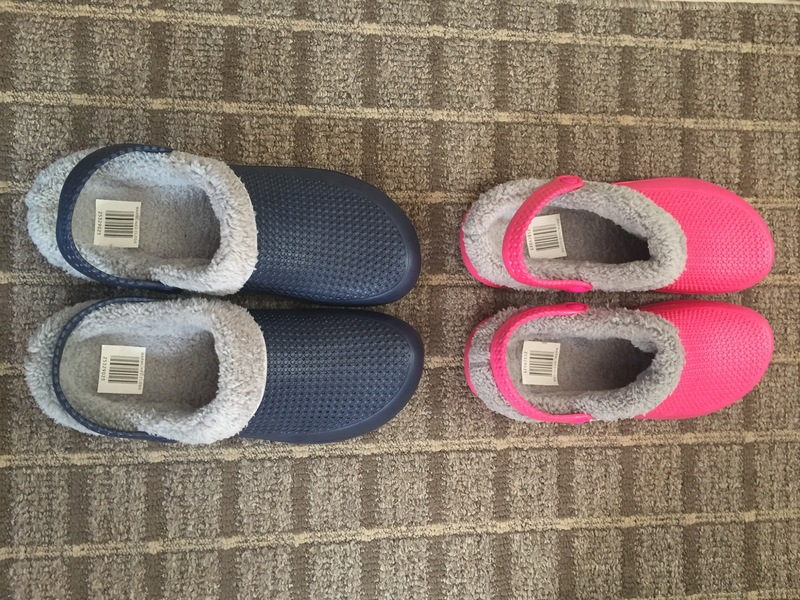 Check out these great warm lined clogg style shoes we got from ALDI. They were £4.99 a pair and you can remove the strap and the lining. They weigh virtually nothing and are perfect for the motorhome. A great investment. Author themotorhomefamilyPosted on June 16, 2017 Leave a comment on Motorhome shoes! Help yourself herbs, bug hotels and deep fried Mars Bars. All to be expected on a roadtrip to Scotland. We went for a long weekend up to my husbands home land of Scotland for a big family reunion. We booked to stay one night in Edinburgh at the Caravan and Motorhome Club site at Silverknowes. This was a great site. Very clean with great pitches. Unfortunately there were no children on the site for our daughter to interact with but it was really geared up for kids. It had a great kids play area which even featured a cute Bug Hotel. Again I would say the play area was aimed at children slightly older than our daughter. But it was all very clean and safe. It had a separate baby and toddler wash room with a small bath with little shelf seat in it, a large change table and even had a little tiny toilet! The adult facilities were very good and clean. One thing I did like was the shower was an on/off tap. Much better than those push buttons. They’re the worst, you get soap in your eyes and the water stops and then you can’t find the button to wash it off! There was a well organised washing up and rubbish facility. You could buy a few provisions in the reception where the staff were really happy and helpful. We also saw the wardens on a regular basis checking the site. There is a bus straight into Edinburgh centre a short walk from the site which only costs £1.60 for an adult single ticket. You need exact change mind or they won’t let you on! The site also runs a minibus into the centre every half an hour until 2pm. One added bonus was the incredible view we found hiding just behind some trees. Over the road from the site and down about 50 steps through a wood snicket we came across a view of the estuary and Forth Rail Bridge. There were people riding bikes, jogging and walking their dogs. The weather was glorious! We only wish we could have stayed longer! The site cost £25 per night, for that we would have expected a water point at the pitch which there wasn’t. And a restaurant / bar / cafe would have been useful. For that reason I am going to score it a 4.5 out of 5. We only stayed here one night. Next stop Strathclyde Country Park Caravan and Motorhome Club site. We had two nights in Glasgow. On the way from Edinburgh we stopped at the Falkirk Mariner Centre pool as it was tipping it down. It was a great facility for kids with plenty of slides and things to play with as well as a wave machine. Our daughter wasn’t so sure about the waves as they were quite big but you could sit right back out of the way and just have them lap at your feet. The centre also has a gym, cafe and soft play for little ones. Also on the way over to Glasgow we spotted The Helix which looks great for kids if the weather is a bit better. As well as tons of activities for kids it has two giant horse head sculptures which are called the Kelpies. One thing to bear in mind travelling to the Strathclyde Country Park is the road network. The roads are going through some extensive works which haven’t updated on Google Maps yet so you need to have your whits about you. There are also a number of unplanned road closures which can cause significant diversions which you might not be expecting. Overall though the site was great. I am starting to see a theme with Caravan and Motorhome Club sites. The baby and toddler facilities were exactly the same. We also made use of the laundry facilities this time to dry our towels. A bit expensive at £1 for 15 minutes but it was worth it to have dry towels again! There was also a kids play area, shop and minibus into town which we took advantage of this time. But again there was no restaurant / cafe / bar. One nice touch I liked was a planter with herbs with a sign saying ‘help yourself’. You might not think to take herbs away with you for cooking so it was a nice touch to add a bit of flavour to your ‘meals on wheels’. Nice touch, help yourself to free herbs. I give this site a 4.5 out of 5 for lack of restaurant. One thing I did try that I have always wanted to when I went to Glasgow is a deep fried Mars Bar. This sounds like a truly magical experience and one I have wanted to try at least once in my life. And what better place to experience it than at the fish and chip shop where Justin Bieber went for battered Haggis and chips back after an all night sesh in October 2016. Well if it is good enough for the Bieb’s then it is good enough for me! Magic! The rig is all packed up. Lets get on the road and get our first trip under our belts! So we’re packed and ready to go on our first adventure! We picked Windermere in the Lake District for our first adventure. We found a lovely site called Park Cliffe about 10 minutes outside of Bowness. I am going to give it 5 out of 5 because I have no frame of reference. The pitches are great, plenty of space, lovely and level. The facilities are really clean. They have private bathrooms which can be hired for a £10 deposit which is great for bathing the little one. The staff are really helpful and friendly. There is an adventure playground which is perfect for kids around 2 – 11 I would say. Our daughter is just a little bit young to appreciate it. It has a bar, restaurant and shop. The bar even did a quiz on the Saturday night but it was a bit late for us as the little one had crashed out from all the fresh air by that point! But all in all, we managed pretty well with what we had brought. We have another trip away planned so we will add a few things and remove a few items we feel unnecessary and see how we go. To pack or not to pack? Weight limit in mind, lets get packing! Clothes for the family (the question is whether to leave a whole wardrobe in the rig or pack a bag each time you go away). We have opted with leaving a minimal wardrobe in the rig and taking extra for each trip. I have tried to make the rig more homely and have added some pictures that our daughter has done at nursery. Simple really. With the car seat, we went with the Joie Every Stage Child Restraint. The motorhome doesn’t have Isofix so we needed a seat that can be fixed in place with a seatbelt. This seat seemed to have the best safety rating and it can be used right the way through to age 12. I was concerned about the sleeping arrangements for our daughter as she is in the bed at the back over the garage. There is a child net there which hooks onto the ceiling but it is quite lose and I am majorly concerned she could fall out. We had a few different thoughts on solutions from baby gates to bed guards. In the end we went with the Dreambaby Retractable Gate from Argos. It fits the whole gap and nearly goes right up to the ceiling and we can retract it quickly if our daughter needs us in the night. She can also see through when she is on the bed. I feel much happier now that she is completely safe. I am sure we will have forgotten something and also packed way too much of other things but you’ve got to start somewhere. We just need to get a weekend away booked so we can try it out! 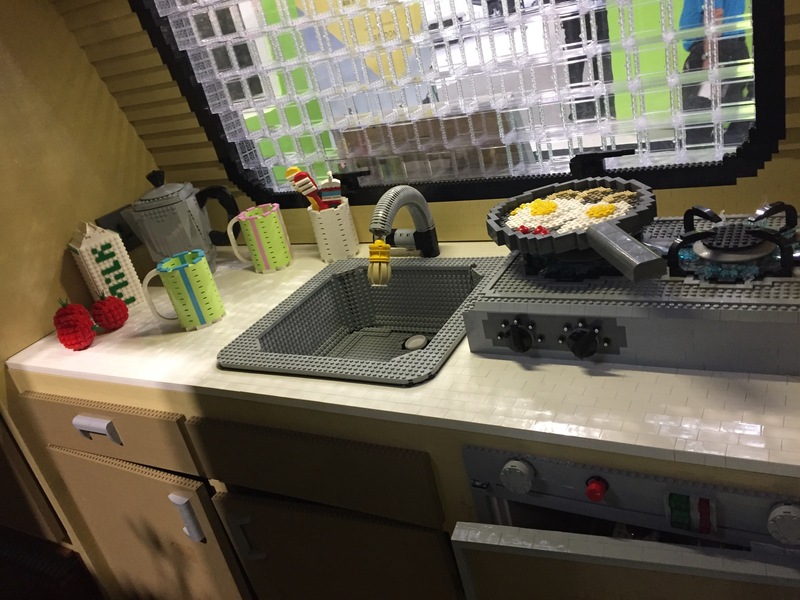 Author themotorhomefamilyPosted on May 21, 2017 Tags motorhome, motorhoming with family, Packing, Packing up a motorhome, What to take in a motorhomeLeave a comment on To pack or not to pack? An insight into the layout of the new rig and why we opted for this layout. I thought I would share with you the layout we have gone with in our motorhome. I was staggered by the huge variety of different layouts you can get. Who knew motorhoming could be so versatile. I guess people want different things at different stages in their life. The front of the rig. Here is a shot of the interior facing the cab. First of all the cab seats don’t rotate so that means the cab and the hab will remain totally separate units. It is a 6 berth meaning it will sleep 6 (if you don’t mind literally living in each other’s pockets). Personally I think we will have a maximum of three adults in there at any one time! There is a huge (super king sized) bed over the cab. I know this because the only sheet that will fit it is super king size. Those two grey stubs are for the ladder to climb up. There is a net and a curtain that closes the bed off from the rest of the cab. There are two small windows at either end of the bed. I will let you know if it feels claustrophobic when I first sleep in it! There is a two door wardrobe behind the driver’s seat and the two doors at the bottom is a shoe rack as the gas bottle is stored behind it (accessed from outside). Behind the passenger seat is a rearward facing two person bench seat with seatbelts, a table and a window about the table with blinds and curtains etc. Above the table are three cupboards with locking lift up doors. The rear of the rig. Facing backwards you can see the door is on the left of the motorhome. Apparently this is the European side. Above the door is the control pad for the motorhome, a TV aerial point and a plug socket. 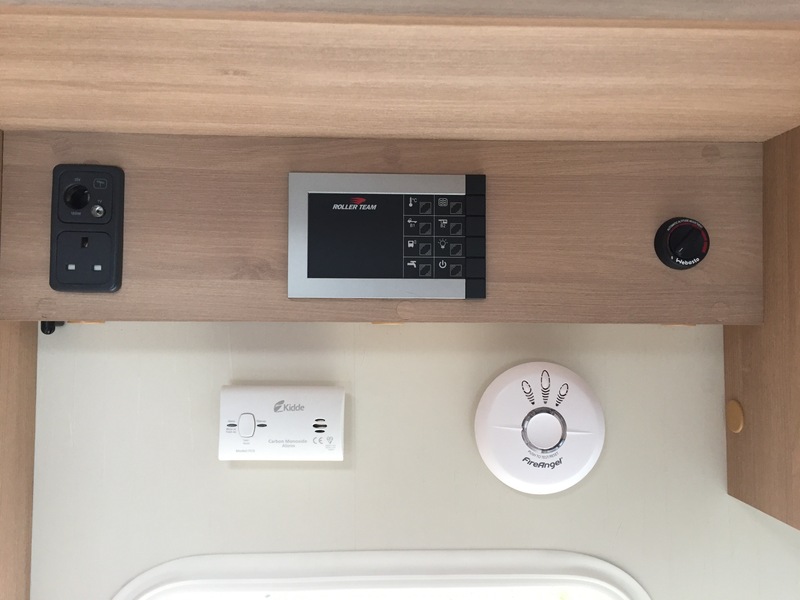 The control panel, carbon monoxide detector, smoke alarm, tv aerial and plug socket. Also on the left is the kitchen with three gas hobs, a small sink and tap and a small area of workspace with another window above it. Above the window are two more cupboards with locking lift up doors. Below the hob is an oven and grill. And next to that and below are three deep drawers. As mentioned in a previous post these drawers aren’t entirely practical as they are so deep so I need to work out a solution to most effectively use this storage. Next to this unit is a large fridge freezer. Home away from home! On the right hand side is a further forward facing two person bench seat with seatbelts. Below these seats is a plug socket. The bench seats can be made into a further double bed by removing the table and adding some extension panels. Shower room. No other way to take that pic without me in the mirror! Behind the seats is the shower room. Inside there is a walk in shower with a proper shower door. I much prefer this layout to the ones that are simply wet rooms and the water goes all over the toilet (and inevitably the toilet roll you have forgotten to put away)! 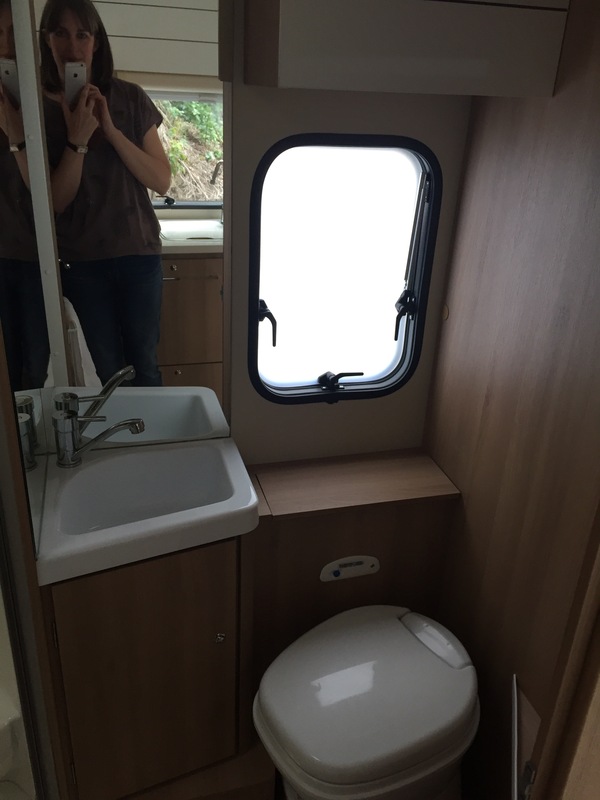 There is a small toilet, sink and three cupboards and cubby holes. There is a little shelf but don’t make the mistake of putting anything on this and driving off. There is a plug socket in one of the cupboards and a window above the sink. Finally at the back is a further raised double bed with three cupboards and four cubby holes for extra storage. There is a net that can be hooked up to stop children falling out. This is where our daughter will sleep. There is a window right at the back and one on the left hand side. Below that bed is a garage which can be accessed from outside for storing bikes or additional luggage. There is also a bike rack on the back. It is really light and airy. I think this is partly down to the wood that has been used in the interior. In some of the later models the wood is quite dark which did make the whole thing seem a lot darker. Exciting times! The day we picked up the keys to our first motorhome. Today we picked up our brand new motorhome. After a very thorough handover we were on the road (we had already sorted out tax and insurance). After about 20 seconds my husband was already asking me to see if I could find what was making the rattle sound around my seat. Mmmm, I think he is going to have to get used to that! When we got the keys. Shame the weather was a bit dull. It perked up later in the day. We got it home and immediately started to fill it with our ‘essentials’. I imagine half of it will reemerge at some point when we realise we don’t need it. One thing we are struggling with is kitchen items. They don’t pack all that well and are very rattly. That’s not going to go down well with my husband. There are only two drawers in the kitchen and they are very deep. I need to have a think about a storage solution so I will come back to you on that. We tried to be methodical and weighed everything as it went in. In a further post I will try to document everything that we packed to give you an idea. We also took it down to a local weighbridge to get an idea of the weight. So we’re set and my husband is planning to use it for a work trip tomorrow night. We also have a wedding coming up that we are planning to use it for so we can give it a couple of test runs before our daughter sleeps in it. She is just at the age where she pulls herself up onto her knees and feet so I want to be completely comfortable that she will be safe. We will work through a few solutions and I will write a further post on our solution. In the mean time, thanks for reading! I need to get one of these for the rig! Author themotorhomefamilyPosted on May 11, 2017 May 17, 2017 Tags motorhomeLeave a comment on We’ve got the keys!